Stormborne: Infinity Arena - is a mobile action game that brings the fun and excitement of playing console action games to the palm of your hand. In the world of 'Stormborne: Infinity Arena', you become an unknown gladiator who desperately battles to escape a series of maze-like passages in search of lost memories. Challenge your strength and never give up as you fight to win against all odds. Bring yourself to new heights of power as you level up and face more and more formidable enemies. Freedom and truth are within your grasp! Experience the pinnacle of action gameplay by utilizing 3 directional attack and defense controls. The thrill of evading and counterattacking at just the right moment before your enemy's blade hits you is truly exhilarating! Forget about old automated control systems. Feel the gut-wrenching tension building as you dodge your enemy’s attacks, plan your next move, and strike your enemies down..
Stormborne: Infinity Arena is a graphically stunning game, yet it only requires 80MB on your device storage. You can also enjoy the same high quality graphics on low spec devices. Stormborne: Infinity Arena is designed to play perfectly on whatever device you’re using. Each ability triggers its own unique effect under particular conditions. Plan the most effective and powerful attack and defense strategies, making the most of the skills you have. Strive for the honor of being the gladiator of all gladiators. Take part in weekly ranked competitions and get a chance to receive exclusive rewards. 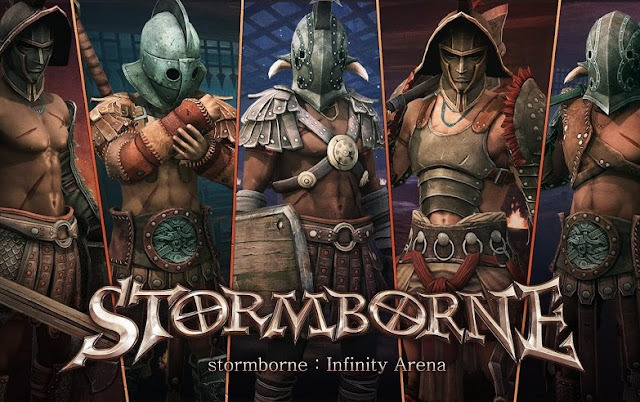 Stormborne: Infinity Arena: install APK and play the game.